Selling for $39.99 0 0 Like this product? 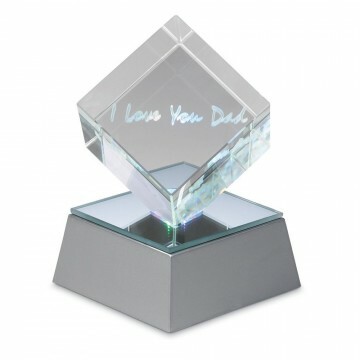 Remind Dad how much you care with this clear acrylic cube that says "I Love You Dad". A unique gift for Dad lets him know how much you appreciate and love him and how special he is in your life. 2 1/2" square x 4" high. Remind Dad how much you care with this clear acrylic cube that says "I Love You Dad" in glowing multi colors when the LED lighted base is turned on. I gave this to my father for Father's Day. He loved it and thanked me repeatedly for 3 months! What the description doesn't include that the light that illuminates the cube changes in colors repeatedly. It's very pretty and impressive. The batteries last a long time too! I definitely recommend purchasing this product. very nice gift for my kids dad..just wish the wording was a little bigger...but overall a very nice gift. Glad i ordered it.